The All-New SeaStorm 170N Lifejacket (Automatic Harness) from Gael Force. Designed to sit high for comfort and ease of movement, the SeaStorm 170N (Automatic Harness version) comes with a buddy inspection window which indicates to the wearer and crewmates if the UML Pro-Sensor needs attention. The jacket features Wave Barrier technology, an inter-locking bladder designed to keep water away from the face. Along with a neoprene collar the mesh back also adds to a comfortable wear. 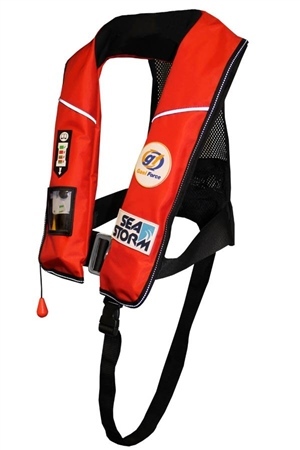 This level of lifejacket is intended for general application or for coastal and offshore with foul weather clothing. Not suitable if heavy tools or equipment are carried. The Sea Storm Lifejacket is tested to a standard of 150N - the minimum buoyancy of the category - and we are required state this on the label. The Sea Storm has an actual buoyancy of 170N.